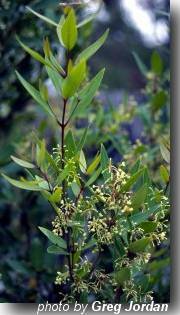 Tall shrub or sturdy tree. Widespread along river banks and on moist shady hillsides. Also found in rocky gullies. An adaptable, slow-growing plant. Not suitable below powerlines. *Flowers early spring, sometimes autumn and sometimes at other times, this could affect seed collection times.Remove flesh from the very large seed before sowing.